Just what youve been waiting for ! 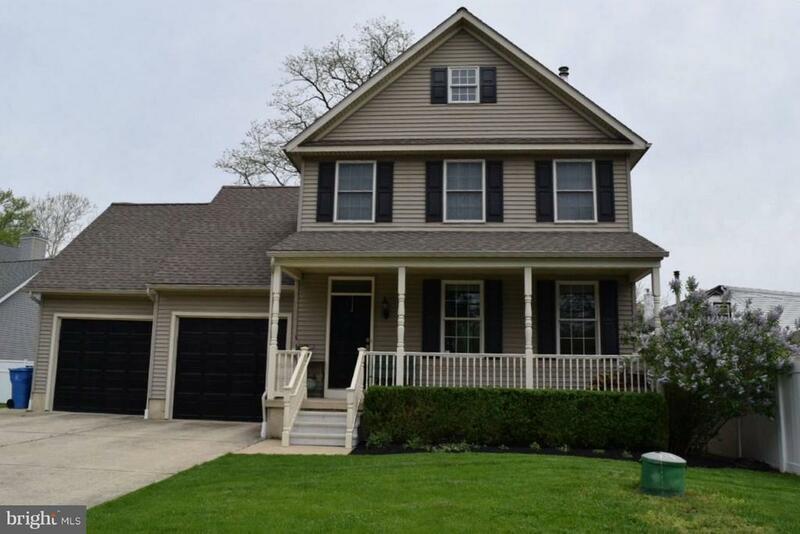 This custom-built "Dream" colonial, only 15 years new, with 4 bedrooms, 2.5 baths, basement and open floor plan will impress you with its stylish design and many features. Enter this custom home and immediately be wowed by the 9 ceilings and light oak hardwood floors throughout the first floor. Foyer entrance with large built-in bookcase provides storage option with a unique look in addition to a large coat closet. Half bath off foyer includes wood vanity with cultured marble top. Enter the kitchen/dining room combination and be flooded by natural light that is perfect for daytime gatherings or dinner parties. Kitchen features numerous 42" oak cabinets with crown molding, extra-large stainless steel drop in sink with pull-out sprayer, garbage disposal and pendulum light. Black appliances include 1-year-old side by side refrigerator with water and ice in door. Newer five-burner glass top stove, built-in dishwasher and microwave, ceiling fan and recessed lights included. An island with extra storage offers additional room for meal-prep. Dining area off kitchen is formatted to fit large table providing ample space for entertaining. Six foot Anderson sliding door to rear yard, recessed lights, door to garage and open staircase to second floor. Adjacent living area with two large windows for natural sunlight, recessed lights and ceiling fan, and Jotul freestanding wood stove is great for chilly temps and saving money on heating! Charming natural wood oak steps lead to second floor that includes main bedroom with 14 ceiling with recessed lights and ceiling fan, main bathroom with 1-piece fiberglass tub insert makes cleaning a breeze. Ceramic tile flooring, white vanity with culture marble top, spacious linen closet and exhaust fan with hear. Two additional bedrooms with wall to wall carpeting- one with recessed lights and ceiling fan the other with ceiling fan. Spacious room over garage has been utilized as a fourth bedroom but can be used for extra family room or office. Features wall to wall carpet, two ceiling fans, built-in storage nooks, and additional electric baseboard heat for your liking. Full basement with 9 ceilings has been divided for additional living space and storage. Features wall to wall carpet, sheet rocked walls and electric. Exposed beam ceiling is painted white. Separate room provides storage and laundry area with washer dryer hookup, laundry room and mechanics. When pulling into the driveway you will be impressed by the picturesque classic colonial exterior with maintenance free vinyl siding featuring black shudder accent, three-dimensional roof, Anderson windows throughout, large covered front porch with beaded ceiling and recessed lights, maintenance-free PVC railing - A great space for your rocking chair! 4+ car cement driveway with turnaround, fenced rear yard with 6 PVC and wood stockade fencing. Arborvitae in rear of house provides privacy, and EP Henry patio is great for Summer BBQs. Extras Include 2 propane high-efficient heating systems with central air, controlling temperature while minimizing costs. 200 amp circuit breaker box with extra sub panel for room over garage. 48 gallon high efficient domestic hot water heater. Access panel in 2nd floor hallway leads to attic with half-flooring, electric and 2nd unit for additional storage. Whole-house alarm system . Freshly painted throughout with 6-panel doors with nickel hardware. This home comes with a home warranty service agreement, giving peace of mind. FHA & VA qualified, which makes down payment affordable. Close to 95, bridges, and railroad transportation. Just bring the moving truck and get ready to make great memories! Exclusions: Lilac bush in front yard, instrumental brackets in kitchen, curtains, metal shelving and bike holder in garage, chest freezer in basement, 2 animal wall hooks by front door.